This post is a travelguide about the best places to visit in Hampi in 3 days. We visited Hampi in April and with so much to see and do we wanted to get the best out of our time. With this 3 day itinerary for Hampi you will get to see all the highlights in a comfortable way. It’s hot in the fierce sun and sweat is dripping from our backs. In front of us the rocky landscape of Hampi absorbs the heat and provides little respite from the sun. We are on our way to the Vittala temple and everywhere we look we see remnants of the old Vijayanagara empire. In the 14th century Hampi was the capital of this vast Hindu kingdom and it was described as a prosperous and wealthy city untill it was defeated by Muslim armies in 1565. Its history goes back even further though and people identified the area around Hampi to be the monkey kingdom of Kishkinda as described in the epic Hindu mythology of the Ramayana. 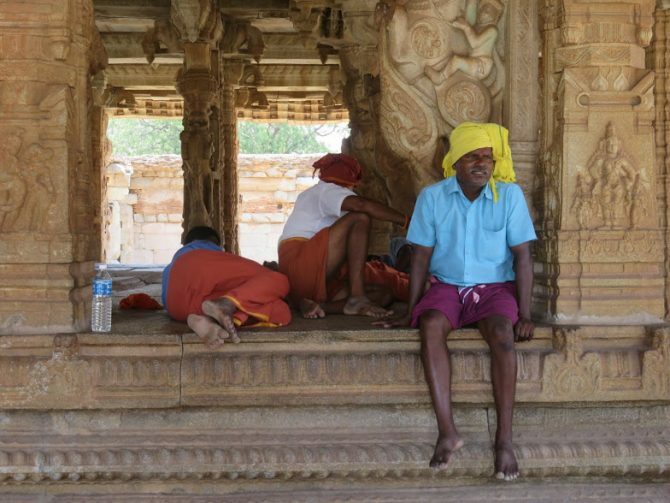 Nowadays Hampi is a small town catering to backpackers and religious pilgrims that visit the still functioning Virupaksha temple and monkey temple. Most backpackers stay much longer than planned, because of the relaxed atmosphere, the slow pace of life and the range of activities available. It would take months to see all the ruins and once you get tired of history you could enjoy the outdoors and go hiking or boulder climbing. For those, like me, that do not have all the time in the world I would say 3 days is the miminum amount of time needed to see the highlights. This Hampi itinerary in 3 days will help you to make the best out of your time and ensure you will see the best places to visit in Hampi. When making a 3 day itinerary for Hampi it is good to realize that the area is dividided by the Tunghabadra river and the sights are clustered around three centers. Most highlights are at the side of Hampi bazaar with one cluster around the Virupaksha temple and another cluster around the royal enclosure. The other side of the river called Virupapur Gaddi also has some interesting ruins and offers a more quiet and peaceful experience. To cross the river you can take a boat that leaves frequently once full. Virupapur Gaddi also has some nice homestays, good restaurants and plenty of places to rent a bike.And that is exactly what I would recommend you to do. Driving your motorbike with the wind through your hair among green rice fields is a highlight in itself. Our first stop was the small village of Anegundi. The Kishkinda Trust is running several projects here to promote rural tourism and to empower the community. The sleepy town remains an off the beaten path destination which is part of its charm and so are it’s green rice paddy’s and palmtrees. On top of that Anegundi has some temples as well. On the way to Anegundi you can stop at the Durga and monkey temple. The temples are still used and a favourite stop for religious pilgrims. The monkey temple or Hanuman temple is of great importance to Hindus because some believe that the Hindu monkey god Hanuman was born here. Both temples require an effort to climb endless steps to the top of a hill that offers a magnificient view over Hampi. The Durga temple is less high and less crowded, but the monkey temple offers a better view. The sanapur lake is a nice spot to end your day and watch the sunset. The blue lake surrounded by rocks gets few visitors, but is a great place to visit in Hampi. The second day we were contemplating whether we wanted to hire a motorbike and drive around ourselves or go with a tuk tuk to see the places to visit in Hampi on the Virupaksha side of the river. We decided that the weather was too hot and treat ourselves on a tuk tuk for the day. This turned out a great decision, because the roads were much dustier and rockier than in Virupapur gaddi. On top of that our tuk tuk driver showed us some temples that were not in our guidebook such as an underground shiva temple and a large statue of Narasimha, the incarnation of Vishnu. The famous stone chariot that is on most pictures of Hampi is in the beautiful Vittala temple. It is a long 2 kilometer walk through rocks and boulders to get there, but it is worth every step you take. If you want to escape the heat I would advise you to do this early in the morning or the afternoon. Tuk tuks are not allowed to reach the Vittala temple, but if you really don’t want to walk there is a crowded white tourist van going up and down. The large statue of Narasimha represents an incarnation of the god Vishnu. It is one of the largest statues in Hampi. Next to the statue is a small temple with a big Shiva lingam inside. The former royal palace grounds offer some interesting sights. Not to be missed are the elephant stables and the lotus mahal. Hampi is a dry landscape and the baths must have involved some advanced engineering. Access to clean drinking water remains a struggle for people now and then. The queens bath is a beauty inside, but the stepped baths used by the citizens of the kingdom are no less impressive. Last, but not least of our tour was the Hazara Rama temple. When our tuk tuk driver stopped we almost felt we had seen enough for the day. We were wondering whether to drag our tired bodies into the sun again for one more temple. But this was not just another temple. This was like a book with the detailed carvings on the walls telling endless stories. Elephants marching forward, women dancing, warriors fighting and horses getting ready for battle. Tip: The Vittala temple requires a ticket that is also valid for the royal enclosure (lotus mahal and elephant stables) and the archeological museum in Hospet. We visited the museum as part of our tuk tuk tour. My advice is that if you have enough time it is worth having a quick look, but not a must see. Our tuk tuk tour left us in awe, but also tired and overwhelmed. The virupaksha temple and some ganesh statues are just accross the river from virupapur gadi and we decided to leave them for the next day. The third day we explored the best places to visit in Hampi on foot. I always have mixed feelings of tourist activities involving elephants. In South India many temples have a temple elephant that hands out blessings to people in exchange for a few rupees. Laxmi is Virupaksha’s temple elephant and every morning around 8 AM she goes to the river to get a bath. Her caretaker gently washes her and she seems to be enjoying this daily ritual. Still, I feel that a crowded temple is not the place for an elephant. Virupaksha temple is still functioning and of great importance for Hindus. It is therefore the most crowded of all temples with both people and monkeys. The monkeys are fun to watch, but you should take care if you carry any food items or even just a water bottle. Behind the Virupaksha temple are two impressive monolithic statues of Ganesh. The hindu god with an elephant head who loves sweets and removes obstacles. Sasivekalu and Kadalekalu Ganesha are an easy walk up the boulders behind the Virupaksha temple and should not be missed. There are three places where you can stay in Hampi. First of all there is Hospet which has the nearest railway connection. The town is a transport hub and not very scenic but offers some decent hotels and convenient if you need to catch an early morning train. The second option is Hampi bazaar. Here you will find yourself right in the centre of everything there is to see. However, there is a constant struggle between the hotel owners and the authorities that rather see the hotels go to preserve the archeological heritage. The third option is virupapur gadi. You will have to cross the river with a small boat that runs between 7 am and 5 pm. This is the most scenic and laid back location and there are some simple but good guesthouses and homestays. We stayed at the virupapur gadi side of the river at Chinnie’s home with Airbnb. A nice homestay with a friendly young couple that are very helpful. It’s a pleasant 15 minute walk from virupapur gaddi main street up the hill. Hampi is best visited during the cooler months of October till March. From March onwards it can get unbearingly hot in Hampi and July will bring monsoon rains till September. Even in the cooler months the sun is strong and there is little shadow among the rocks. Always bring a sun hat and sunscreen to Hampi. Sturdy shoes or sandals are another must for hiking the rocky terrain. At last bring mosquito repellent. Locally you can buy odomos that is great against mosquitoes. Hampi is in the north of Karnataka. There is a daily nighttrain from Bangalore to Hospet. From Hospet you should take a riksha to Hampi (15-20 minutes). If you stay in virupapur gadi take the boat to the other side of the river. The boat runs from 7 AM till 5 PM. There are also daily nightbuses From Hospet to Goa or Bangalore. Be aware that even though some offer a pick up from virupapur gadi included in your ticket this means that you will be stuffed with 6 people in a rickshaw for a one hour journey to reach Hospet from where the actual bus departs. It might be more comfortable and quicker to take the last boat (around 5 pm) to the other side of the river and take a rickshaw from there to Hospet on your own cost. Hospet is a transport hub with frequent buses and trains to places in Karnataka and beyond. During the day hampi is a very safe place. However, the rocky landscape is also the home of snakes and sloth bears. Therefore it is better not to walk around the ruins at night. If you want to see sloth bears you can visit the Daroji sloth bear sanctuary not far from Hampi. Hampi is not more or less safe for solo female travellers than other touristic places in India. There is no reason not to go to Hampi as a solo female traveler, but it helps to dress conservatively and use your instinct. If it doesn’t feel good it probably isn’t. Romance and other scams are not unheard of and it is better not to get too friendly with local men that are eager to talk with you or guide you around. Remember, nothing is for free. It is also better not to walk around alone at night in quiet areas. Wow Ellis you are a rockstar! You seem to have seen more of India than most Indians I know. Hampi is in my bucket list for a long time but I keep waiting for a long weekend to explore it for 3 days atleast, and somehow end up with another plan when that weekend comes 🙁 This is a fantastic guide. I went to Talakad though in Karnataka which is very close to Bangalore. Did you check out the hippie island in Hampi? Beautiful! I went several years ago but didn’t take many photos and I regret it so much. Love the elephant stables! It was so hot when I went, I remember being drenched in sweat. Love India! Lovely photos! So many monkeys! We had a great time in Hampi too, we celebrated Holi there and it was great to experience it in a smaller place with some locals. We also went to the swimming hole further up the river because it was soooo hot when we were there! I’ve never heard of Hampi before but this looks wonderful. I think the relaxed atmosphere would be super appealing.